ABORIGINAL OFFICERS IN THE FIRST AIF ? In 2012 Andrea Gerrard of the University of Tasmania identified an officer of Aboriginal heritage in the first AIF. This serviceman was Alfred John Hearps who volunteered on 20 August 1914 and served with the 12th Battalion at Gallipoli and the Somme. He was promoted second lieutenant on 5 August 1916 and killed two weeks later, during action at Mouquet Farm, 19-22 August. The circumstances of his death were not immediately apparent and the terrible distress this uncertainty caused to his family is recorded in letters in his service record. 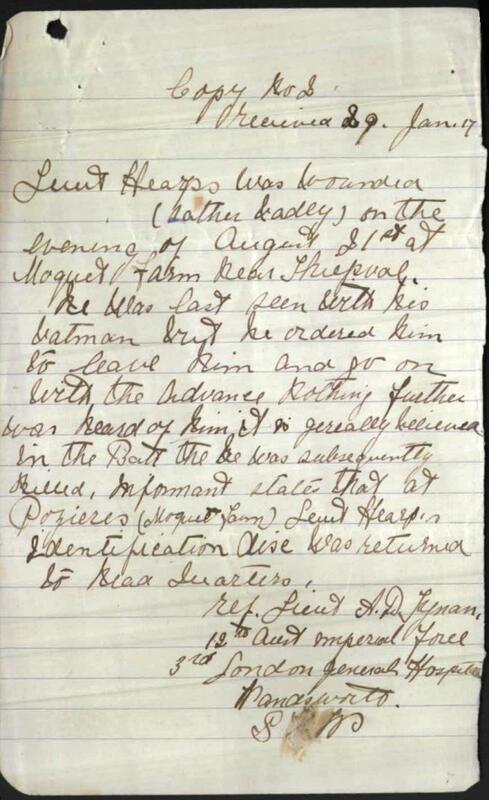 Comment on the death of Alfred Hearps by a fellow lieutenant, A.D. Tynan, 12th Battalion This is amongst papers in Hearps’ service record in the collection of the National Archives of Australia. Alfred Hearps was Tasmanian and a descendant of tribal leader Mannalagenna. Although a description in his Red Cross Missing and Wounded file describes him as ‘a young dark fellow’ it is probable that his Aboriginal heritage was not known to his fellow servicemen. He may well have been one of those men who were regarded by the AIF and its recruiters as of southern European origin. To date Hearps is the only officer of Aboriginal heritage identified by name in the first AIF. However in 2012 Timothy Winegard, in Indigenous Peoples of the First World War (Cambridge University Press, p.199), stated that two men of Aboriginal descent served as lieutenants – one from Western Australia in the 6th Light Horse Regiment and a second soldier from New South Wales, a member of the 51st Battalion. Winegard also drew attention to an Aboriginal man, unnamed, who was awarded the Military Cross (p.237). Later writers have noted Hearps’ status as the only known Aboriginal officer as well as also referring separately to the award of the Military Cross mentioned by Winegard. However to date no one has noted the significance of this award. This lies in the fact that in Australia, during the period of the First World War, the Military Cross was a decoration reserved for commissioned officers and warrant officers. In the light of the information proffered by Winegard, it is possible that this award indicates the presence of yet another officer of Aboriginal descent in the AIF. However while the names of these three men are unknown – or at least have not been made public – and without information to the contrary, it seems likely that they are amongst those Aboriginal men who were identified in the AIF as dark skinned white men or with other ethnicities than their own. The foregoing comments highlight the diversity of the Aboriginal men in the AIF, who include a very few identified in their attestations and in external sources as ‘full blood’, men whose attestations refer to them as ‘half caste’ or similar and others like Alfred Hearps whose Aboriginality was obscured. This entry was posted in Uncategorized, WW1. Bookmark the permalink. 1 Response to ABORIGINAL OFFICERS IN THE FIRST AIF ? Many indigenous people have fought since the Boer War to assist in keeping Australia free, but the treatment of them then and now has got to be seen to believed. They are the first Australians and has always looked after Australia it would be nice to have them acknowledged for once.